I recently watched Sagrada, an intriguing documentary on Netflix directed by Stefan Haupt, about architect Antoni Gaudi and his magnum opus, the Sagrada Familia (or Holy Family) Roman Catholic church in Barcelona. It began construction with its apse crypt in 1882 by architect Francisco de Paula del Villar y Lozano. However, due to disagreements with the promoters of the project, Villar resigned and in 1883, the 30-year old Catalan architect Gaudi, relatively unknown at the time, continued on the work until the crypt was finished. He then proposed a radically new and grander vision based on the curvilinear Art Nouveau style, which is influenced by natural forms and organic structures. It is said that Gaudi was inspired by the finger-shaped rock formations in the mountains of nearby Montserrat. The church, which was consecrated on November 7, 2010 by Pope Benedict XVI, is a UNESCO World Heritage Site. It is estimated to be completed in 2026. 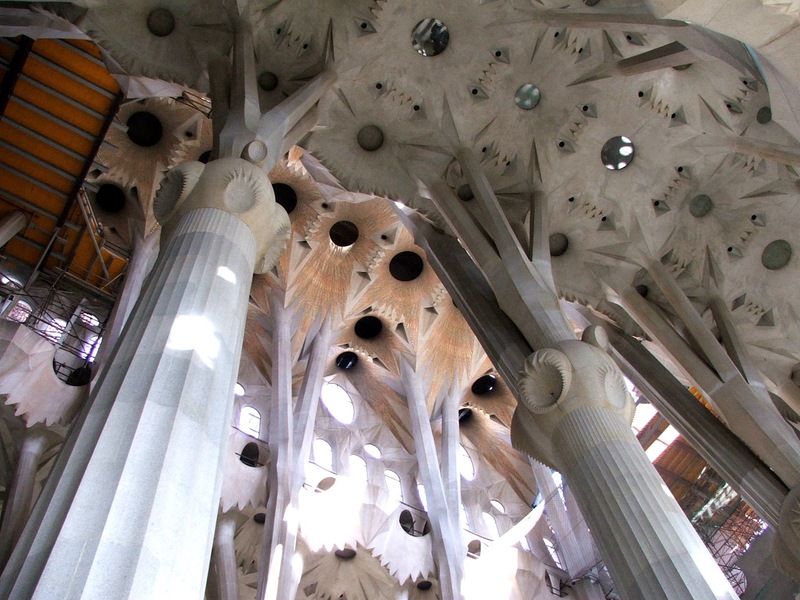 The documentary covers in-depth interviews with the living relatives of assistants and workers who knew Gaudi. 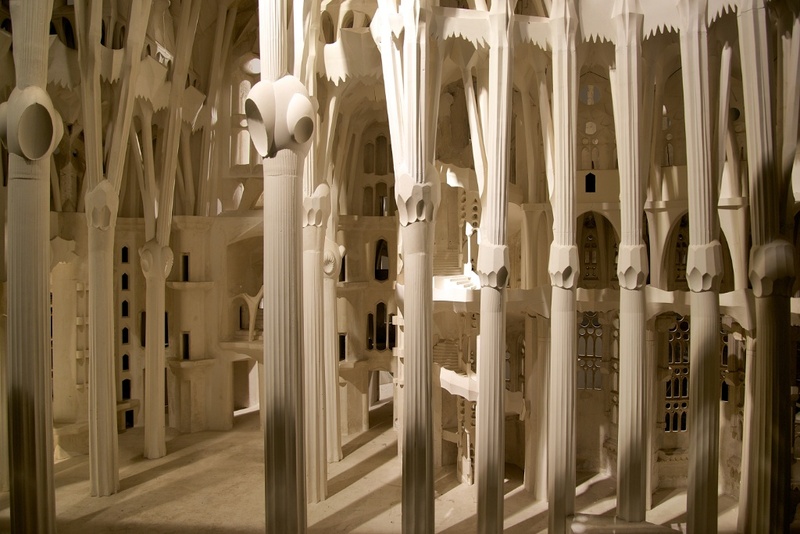 When the Spanish Civil War broke out in 1936, the church construction came to an abrupt halt and merely all the written documents were destroyed, including many of Gaudi’s plaster models that were used during construction. Due to the lack of construction funds, he went from door to door asking for alms and donations. In his later years, Gaudi dressed simply, ate frugally, and neglected his appearance that he was sometimes mistaken for a beggar. The architect spent the remainder of his life dedicated to the building of this church until his death at age 73. He was struck by a tram and lost consciousness. Assumed to be a beggar, he did not receive immediate care until a policeman brought him to a hospital by taxi. By then, it was too late. His funeral procession was followed by thousands of mourners lining the streets of Barcelona to the chapel of Our Lady of Mount Carmel in the crypt of the Sagrada Familia where his body was laid to rest. 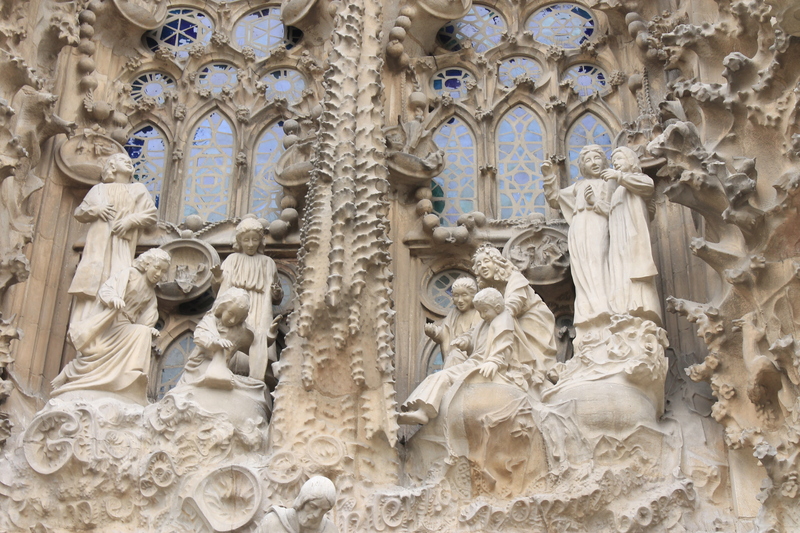 (left) Sculptures from the Nativity Facade were the first facade to be completed between 1894 and 1930. These are more characteristic of Gaudi’s naturalistic and ornate style, depicting scenes and images from nature. 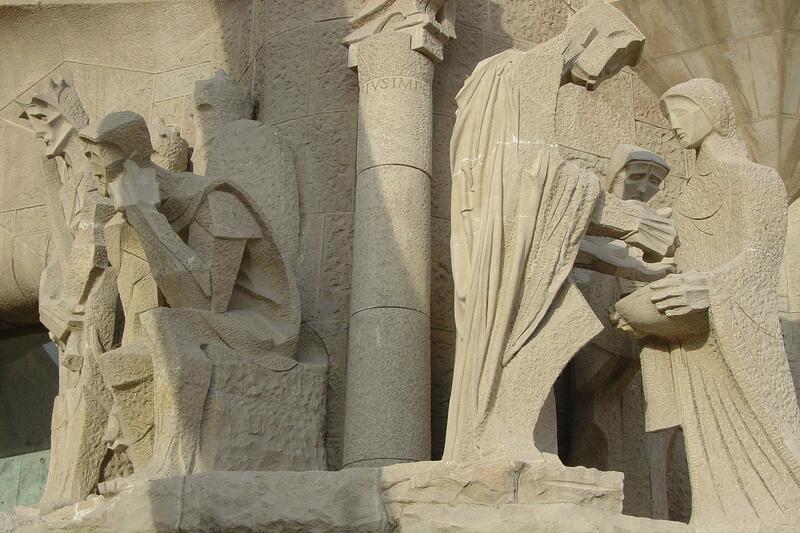 (Right) In contrast, the angular sculptures from the Passion Facade, which began in 1954 following Gaudi’s instructions for future architects and sculptors, depict the suffering of Christ during his crucifixion and the portrayal of man’s sins. The facade is austere and plain with an emphasis on harsh straight lines to highlight the severity and brutality of Jesus’ sacrifice. Josep Maria Subirachs, a Spanish sculptor and painter was hired to lead a team of sculptors to carry out the work, which was often met with harsh criticism for breaking away from Gaudi’s style, and yet it has also been praised by many people including architect Jordi Bonet i Armengol, the son of Gaudi’s architect disciple Lluis Bonet Gari.